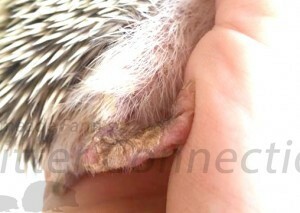 The most common reason that hedgehogs see veterinarians is for skin conditions. Scratching can cause redness or damage to the skin, which could lead to secondary infection. Treatment has the best results if directed at the cause. Skin lesions may be caused by many different conditions including but not limited to cancer, bacterial infection, fungal infection, or injury. Lesions may appear as open sores, red/discolored areas on the skin, or swollen or raised patches. All lesions should be biopsied and cultured if the cause is not identified by observation. An excellent article on skin lesions and cutaneous lymphoma is in the July/August 2000 issue of Lab Animal Volume 29, No. 7. A veterinarian needs to assess skin lesions by biopsy and culture before prescribing treatments. Oral antibiotics, such as Trimeth-Sulfa Suspension given twice a day or Itraconazole. Conofite Spray used once a day maybe prescribed. When severe scratching damages the skin, commonly occurring bacteria on the skin (that our bodies/hedgehogs can usually fight against) can cause an infection. Staph infections are a bacterial infection that can occur when the immune system is comprised. Since the skin is the body’s largest organ and one of its first lines of defense, conditions compromising the skin compromise the immune system. A veterinarian will have to treat a staph infection, but it is not contagious to us as we already have the bacteria on our skin and our bodies can usually fight it off. Lymphosarcoma with peripheral lymphadenopathy is another differential (Hoefer). Hedgehogs are built low to the ground and are in almost constant contact with their bedding. Wet or soiled bedding or chemicals in the bedding can cause serious skin irritations. Hardwood beddings (cedar, pine, aspen) can cause irritation due to the aromatic oils. Changed bedding to a recycled paper bedding if bedding allergies are a possibility. Hedgehogs may fight or become aggressive towards each other if housed or allowed to play and exercise without supervision. Fighting is most common in males. Wounds on the skin should be cleaned and watched for signs of infection. Signs include redness and swelling. Infected or irritated wounds are likely to need veterinary attention and antibiotic therapy. Immune-mediated diseases are a result of the body attacking itself. This article is a work in progress. We would like additional information, experiences, pictures, or other contributions to this article.